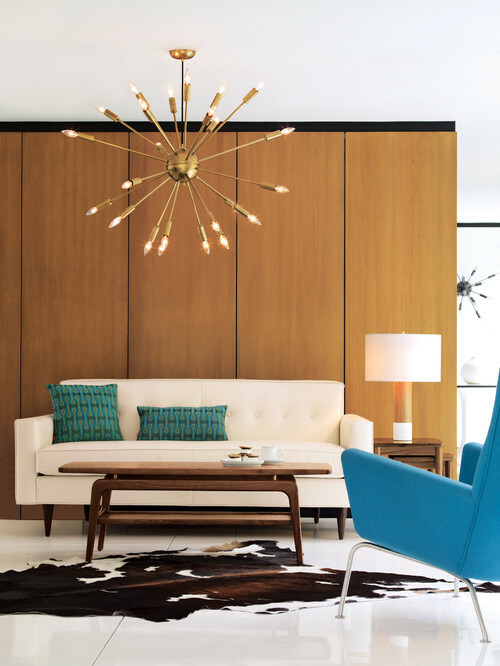 Today’s installment of our Defining Your Style series will focus on one of the most popular and influential interior design styles of the last century- mid-century modern! Spanning the fields of architecture, interior design, industrial design, and urban development, this sleek, elegant, and forward-thinking design aesthetic reigned from approximately the mid-1930’s to the mid-1960’s. 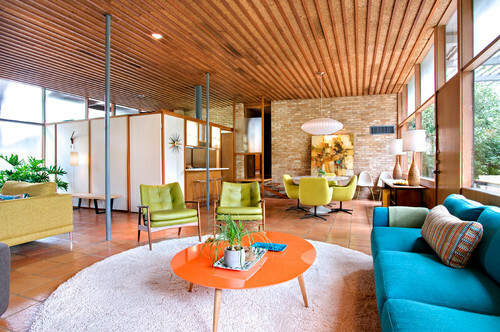 What is mid-century modern style? Mid-century modern style was the American answer to Europe’s Bauhaus style. Bauhaus design philosophy was based on the idea that form should follow function, resulting in home, furniture, and product designs that eschewed ornamentation in favor of spare, geometric simplicity. Mid-century modern is similar in many ways, but the American iteration tended to be more organic, with softer shapes and extensive use of natural materials. The result is a style that has the minimalist simplicity characteristic of modernism with more warmth and a more casual attitude. The years that spawned this design style were years of scientific discovery and the “atomic age,” which is visible in much of the pattern and product design from this era, like the ever-popular starburst clock. If you love geometric patterns, Eames chairs, Saarinen tulip tables, teak and walnut woods, sleek open shelving systems, and other staples of mid-century design, this look is for you! Of course, we are living in 2014, so how can you embrace the style without making your home look too much like a Mad Men set? The key is to incorporate mid-century classics with other pieces that support the look, even if they are not from the same era. Most of us don’t actually want to live in a time capsule, so be open to furnishings, accessories, and art that share basic principles or stylistic elements. For instance, a rustic table, Shaker style chair, or Japanese vase may all have simple lines and natural appeal that would coordinate beautifully with mid-century furnishings. Kilim rugs, otomi fabrics, and other folk-inspired textiles and soft goods add a dose of color, pattern, and texture to mid-century spaces. The atomic, geometric, and space age patterns used extensively in mid-century surface design still look amazingly fresh and fun in today’s homes. 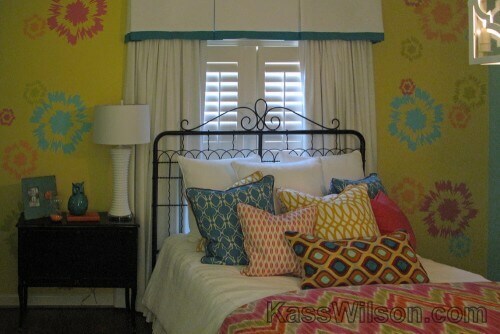 The decorative painting project above, Splash, incorporates sunburst-esque splashes of color, tying in with a rainbow of geometric patterned pillows to add contemporary appeal to a girl’s bedroom. Decorative painting and faux finishes can add a whole new dimension to mid-century-inspired interior design for the present day. Consider adding a fun, retro pattern to the walls, or incorporating standard mid-century wood tones like teak, walnut, oak, or rosewood into your architecture with a faux woodgrain finish for cabinetry, walls, beams, and other elements. 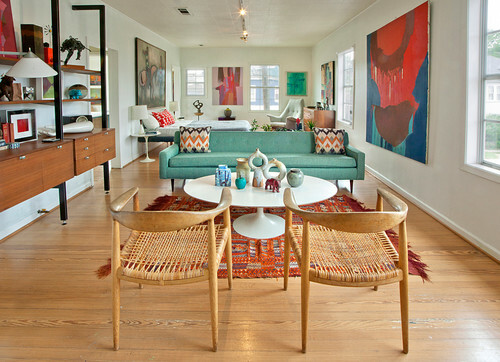 What do you think of mid-century style? We’d love to hear your feedback in the comments below! visiting this website dailly and get nice information from here all the time. © Copyright 2019 Kass Wilson All Rights Reserved.